To make kimchi: In a large bowl, whisk together rice wine vinegar, fish sauce, Sriracha, sugar and salt. Whisk in ginger and garlic. Stir in cabbage, carrots, cucumber, green onions, radishes and cilantro leaves to combine. Place a lid on the bowl and refrigerate 1-4 hours. To make burgers: Place turkey, onion, soy sauce, oyster sauce, sesame oil, salt and pepper in a bowl. Mix, using your hands, until ingredients are evenly combined. Form 4 burger patties. Heat a grill to medium-high heat and coat with cooking spray. Once grill is hot, place burger patties on the grill. Cook on each side, with grill lid closed, for 5-6 minutes on each side, until internal temperature of burgers reach 160 degrees. 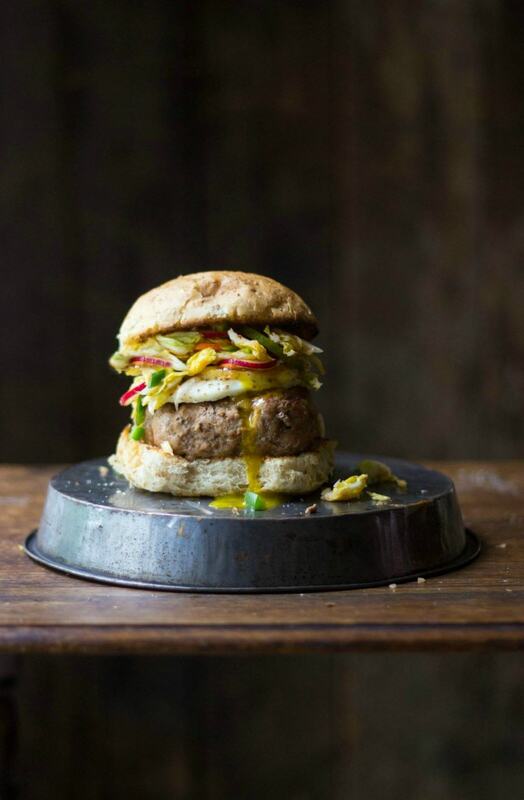 Place burgers on toasted bottom buns and top with fried egg (optional) and a few scoops of kimchi. In a small bowl, whisk together Sriracha and mayonnaise, and evenly distribute Sriracha mayo on each burger (optional) and top with toasted top bun.